After a couple of fun filler issues in All-New X-Men, we’re finally starting to get into our next big story arc. Bendis has been on a roll with these X-books and the last issue (#30) was one of my favorite so far. I feel like even though not much was happening, he was able to bring in some great character elements and expand more on the X-Men from the past being teenagers. Although this issue does begin the next arc, it also allowed for more of a transition between the last two issues than previous arcs have. As I stated earlier, the writer on this issue was the one and only Brian Michael Bendis. 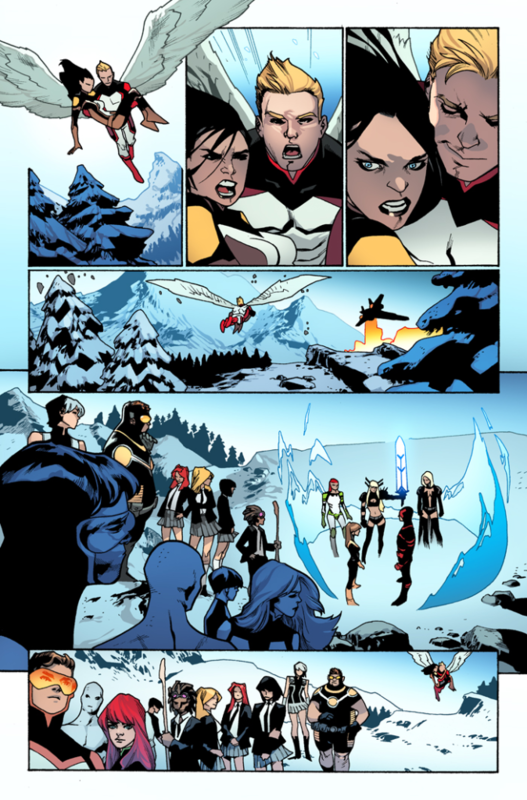 The artist here was was Mahmud Asrar with some help from Marte Gracia and Jason Keith on colors. The letterist was VC’s Cory Petit and the sweet Iceman cover was done by Immonen, Grawbadger and Garcia. This issue comes out of the bat swinging with a quick look in on the ultimate Tony Stark doing some business. Once that finishes up we cut back to our X-Men squad just in time to see Angel and X-23 get home (the couple doesn’t make sense but, I love it). We then get a quick peek at the Adult squad taking off for the Xaiver’s Last Will and Testament story line in Uncanny X-Men. 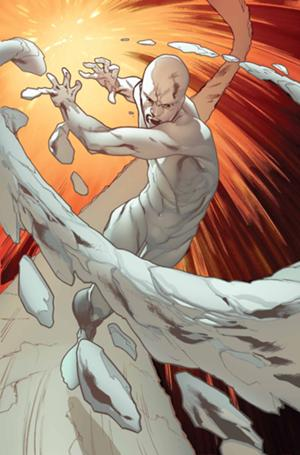 Iceman immediately begins annoying Angel about his and X-23’s absence. The rest of the issue ends up being some quick setup for the next story arc with the old school X-Men team taking the offensive and going to help a new mutant. Quick side note, making Angel and X-23 a couple was one of Bendis’s smartest moves of the series. Not only did he help make this Angel interesting for the first time this whole run but, he also managed to make X-23 seem like a teenager and not just a murder machine. Bendis did a pretty good job constructing the story here but I feel like he did have a couple of misses. Most of the best parts from this issue come from before the centerfold, which ended up separating the issue rather well. The first half was the part that I enjoyed the most because it allowed Bendis to continue to build up the characterization for this group and make them feel more like real people. The second half sadly just felt a little rushed and confusing. While I’m excited to see where this new arc takes us I just wish that the plot of the book and the characterization could be more intermingled, allowing more time for both. The artwork within this issue was done by Mahmud Asrar. He is able to capture the characters well enough but it just felt a little flat for me. I realize that his art is good enough and gets the job done but, I’ve become spoiled with X-books. When I’m used to Stuart Immonen and Chris Bachalo on art though, it’s tough to deal with someone who just can’t do these characters as well. All things considered this was another great issue of All-New X-Men. It’s no secret that the X-Men are my favorite superhero team and Bendis has done well by me so far. If you’ve been enjoying the book so far or even if you fell off along the way this is a good issue to pick up.